Waggle your way through the pain barrier as you battle to beat your best. Wipe that stray thought out of your mind, we'll have no thinking here. You're in the army now lad. And so pass all great thinkers from profound theories to monotonous drilling on the assault course. Alas poor you, the thought you could have done without, (and nearly always did), but all this exercise can't possibly be good for your health. Once more the dulcet tones of the sergeant direct you towards the assault course and the pain begins. 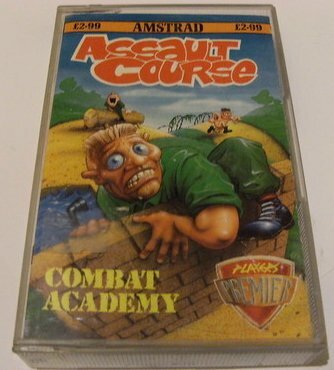 This game reaches new heights of realism as you feel all the pain the assault course bound character feels - yes, this is a joystick waggler to beat all other wagglers. You stand on the start line, nerves and muscles straining for the off, and away you go. It is not a case of waggling so fast that your joystick melts but a constant waggle to get those legs pumping. The first obstacle you hit head on (literally if you forget to jump) is the wall. A fair turn of speed is needed to mount this obstacle combined with a well timed jump. Over the first hurdle and it is another standing start from the base of the wall. Building up a good head of steam at this stage of the game is essential for two reasons. One, you are competing against the clock and two, those nasty little water jumps take a lot of clearing. Having gained your footing and muddied your boots, you rev up the stick for the serious obstacles. Crossing the rope over the water requires some serious sweat. Fall below the purple bend on the speedometer and you will take a dive. About now your arm will resemble a piece of lead tubing but you can't give up now, you're almost half way there. The log presents a different form of challenge as speed is now fatal; your step must be slow and constant. The final obstacle between you and the next course is the rope swing. You must attack this obstacle at speed as you leap for the rope but your problems do not end here as a timed release is essential. All the stops are out as you speed across the finishing line. After checking your now defunct arm, you steal a glance at the timer. If you complete the first course in under one minute and twenty five seconds the next challenge awaits but if you fail you lose one of your three lives and restart the course. Restarting a course is brain numbing as well as arm numbing. 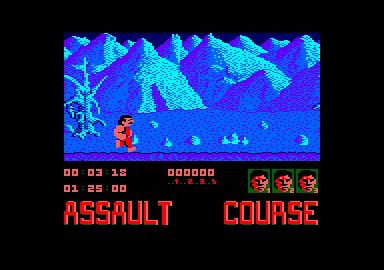 The second assault course is a different colour but essentially the same. The obstacles are now familiar but their placing and number vary from that of the first course. Nobody ever said life in the army was easy but if you enjoy pain and have a few spare joysticks to burn then go for it - you never know, you may get to like it. Even if you don't, it's character building, and it'll make a man of you, my son. 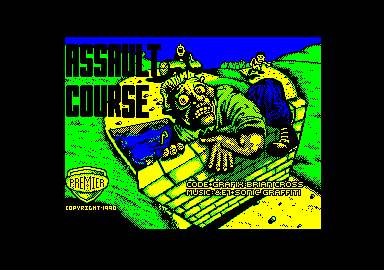 » Topic: Cheats, pokes ou solution pour "ASSAULT COURSE"